Sometimes the best films have the shortest reviews because they set out to do something very specific and do it very simply and very well, with any pyrotechnics or flashiness: just creating writing and acting. The writing is down to Emma Donoghue, who has adapted her own best-selling novel for the screen in this faithful and deeply affecting drama. The story is told from the perspective of a bright young five year old boy called Jack, who with his mother is imprisoned in a suburban garden shed by their abusive captor, Old Nick. The first half of the book and film sees us grow in admiration for Ma, and the clever way in which she tries to keep her son educated, well nourished and safe against all odds. Their is a pivotal point in the book which I won't reveal here, and after that both mother and son face even greater challenges that echo and comment upon the earlier ones. The amazing thing about the book was Donoghue's ability to put us convincingly and firmly in the mind of a small boy in an unthinkable situation, and the movie successfully manages to bring this to the screen. Director Lenny Abrahamson (FRANK) uses the camera imaginatively to render a child’s eye view of the world and it’s testament to his skill that although most people watching this movie will know exactly how it turns out, the escape plot is incredibly tense. But the reason why this film is as emotionally affecting as it is, is down to the performances of the two lead actors. 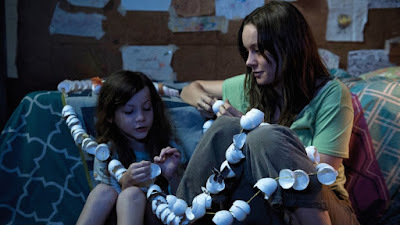 Brie Larson has always been impressive, not least in SHORT TERM 12, but her evident rapport with Jacob Tremblay, who plays Jack means that every scene is laden with emotional impact. I defy anyone to watch it without tearing up at several points during the narrative. Sometimes the best movies are simple in their concept. A moving story well acted. Sometimes you just have to stand back and watch talent at work. ROOM has a running time of 118 minutes and is rated R. The film played Telluride, Toronto and London 2015 and will be released in the USA on October 16th and in the UK on January 29th.